Table of Contents Next: Symes, George W.
SYMBOL was the second major wartime diplomatic conference between Roosevelt and Churchill, following the ARCADIA conference of December 1941 to January 1942 and a second minor Washington conference on 20-25 June 1942. SYMBOL was held in Casablanca in recently liberated French North Africa on 14-24 January 1943 and was widely publicized, becoming known to most of the world simply as the Casablanca Conference. The conference was primarily concerned with the thorny issues of future Mediterranean strategy and the northwestern Europe invasion, but two decisions coming out of the conference were significant for the Pacific War. First, the British reluctantly agreed to attempt the liberation of Burma in 1943. The Americans considered this important because of the high value they placed on the contribution China might make to the war against Japan. The British were far more skeptical of Chinese military potential and saw the Burma operation as of only limited value as a way to restore Imperial prestige and prepare the way for the recapture of Singapore. The Burma campaign of 1943 was eventually scaled back to a limited offensive in the Arakan that proved unsuccessful. The second decision coming out of Casablanca was to establish the unconditional surrender of the Axis as the Allied war aims. Roosevelt announced the policy so casually, and Churchill later expressed so many reservations about it, that the announcement has sometimes been characterized as a spur of the moment action by Roosevelt. This was not the case. The policy had been discussed in advance in Washington and during the conference with Churchill as a way to reassure the Russians and Chinese that the western Allies would make no separate peace with the Axis at their expense. The policy was also aimed at preventing the Axis from making any claims that they had not been totally defeated, as was widely believed in Germany following the First World War. The Nazis had exploited this "stab in the back" theory in their rise to power. The Axis made much propaganda out of the unconditional surrender policy, emphasizing the harsh prospect of a dictated peace and ignoring the accompanying announcements that the Allies sought no territorial gains and did not intend to destroy or enslave the Axis nations. However, it seems likely that, with total government control of the press in the Axis nations, the Axis would have made effective propaganda out of any announcement of Allied war aims. Gaddis Smith (1985) has argued that the real harm of the unconditional surrender policy was in deluding the Americans into believing that winning the war was all that mattered, and then world peace would be all but assured. A third announcement at the Casablanca conference was that the western Allies would renegotiate the "unequal treaties" with China and renounce claims of extraterritoriality for their citizens in China. Meant as a sop to Chiang Kai-shek, the announcement had no discernible effect on the Chinese attitude, though the new treaty was signed on 11 January 1943. A notable feature of the conference was that U.S. Secretary of State Cordell Hull was not invited. Indeed, Roosevelt brought no senior State Department official with him, reflecting the schism between Roosevelt and the State Department on foreign policy. Another notable feature of the conference was the relative lack of preparedness of the Americans. 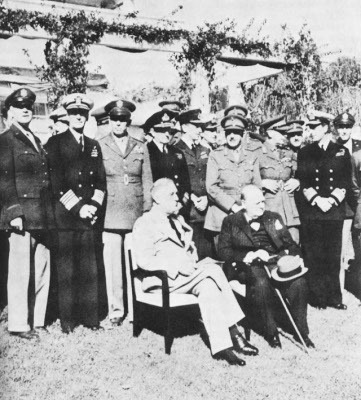 Roosevelt brought a much smaller delegation to the conference than did Churchill, and the British delegation brought a large number of carefully prepared position papers. The Americans left the conference feeling that they had been ambushed, and Brooke's obvious contempt for the strategic abilities of Marshall and the other senior Americans led to considerable resentment. The Americans would come to the TRIDENT conference in large numbers and with much better preparation.